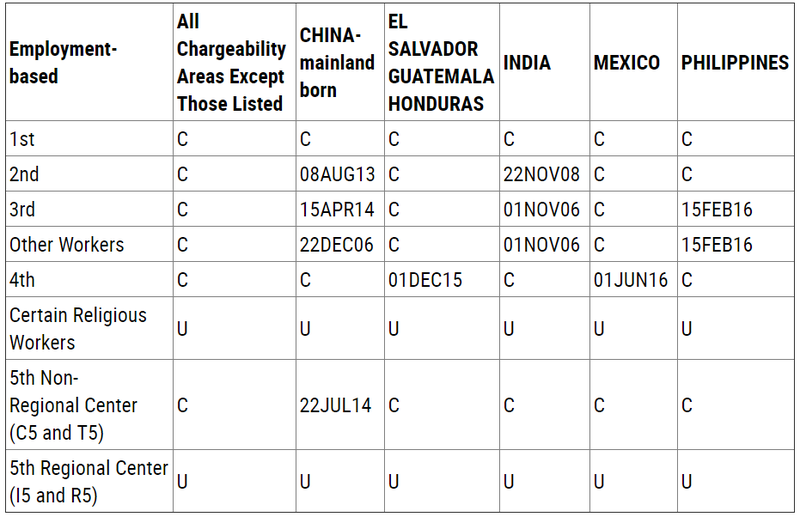 The listing of a date for any category indicates that only applicants with a priority date which is earlier than the listed date may file their application (Department of State, “Visa Bulletin for January 2018”). On the chart below, the listing of a date for any class indicates that the class is oversubscribed; “C” means current, i.e., numbers are authorized for issuance to all qualified applicants; and “U” means unauthorized, i.e., numbers are not authorized for issuance. (NOTE: Numbers are authorized for issuance only for applicants whose priority date is earlier than the final action date listed below) (Department of State, “Visa Bulletin for January 2018”).